Topaz comes in a sunset of colors from red-orange, pink and peach to orange-gold and yellow-brown as well as a sky-blue. With this wide range comes a broad price range as well. "Smokey Topaz" is a misnomer for a form of quartz. Most gemstones, including diamond, need enhancement through cutting or treatment to look as they do in a piece of jewelry. 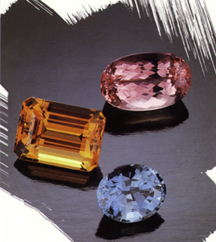 Since the 1750's, Topaz has been heated to permanently achieve its "sunset" hues. Topaz is also safely irradiated and heated to permanently produce its brilliant shades of blue. Though Topaz is suitable for daily wear, remove before engaging in activities such as sports, housework and gardening as Topaz is sensitive to knocks. While today we are not limited by tradition, the symbolism of Topaz is treasured as a gift for November birthdays and as a talisman for the sign of Sagittarius, while the peach to red color of Imperial Topaz commemorates the twenty-third anniversary.